NAREP leader Elias Chipimo says President Edgar Lungu should have used the address to Parliament to tender his resignation and apologise to the nation for taking it on a wrong path. Speaking when he featured on Radio Phonix’s live interactive programme ‘Let the People Talk’ this morning, Chipimo said Friday’s address to Parliament should have been an opportunity for President Lungu to correct his mistakes and set the country on a new path. He said Lungu should accept that he has failed and let his Vice President Inonge Wina complete the remainder of the term. He explained that Wina should bring in people that can represent a unity government. “This is not the time for President Lungu to give speeches. Let him use that opportunity in parliament today to resign and we will give a proper send off. Let him say I have tried but it just hasn’t worked. Let Mrs Wina run the show from this time on. Let her bring in people that can represent a unity government as wind down the final years of the PF in power,” he said. Chipimo added that doing so would bring a sense of purpose, relief and unity to the country. He said Lungu had failed to unify the country by bringing the genuine opposition on the table and propagate a national agenda. “It is time that for the good of the nation he simply came up with a deal for the Zambian and said look I have travelled a little bit to much and perhaps I have not been sensitive to the cries of the people in terms of their real needs and the kind if things they are going through, I haven’t embraced the true spirit of unity in terms of bringing the opposition… And am talking about genuine opposition not these people who would like to be hangers on, who will go out and sing praises about the President who happens to be in power but in reaching out genuinely to the opposition, I have made some mistakes and I would like to make amends and that reason…like what they did in Ethiopia you know am going to step aside but its on the understanding that this is how we want to move the country forward, it will bring such a sense of relief, such a sense of purpose, such a sense of unity, especially if they could rally behind an idea,” he said. And the opposition leader says Zambians have been short-changed as regards the opposition MPs offering checks and balances. He said the opposition in MPs were not doing their job in parliament saying MPs should not leave the job of informing citizens to journalist only but that should help the fourth estate by ensuring that their debates are objective. He said parliamentarians have the right to call public officers and ensure that the right information is given out when there is an issue of public interest. On the impeachment of the President Chipimo said he supports the motion to impeach Edgar Lungu and that the debate to impeach the President would offer Zambians an opportunity to hear what he has done. He said the important thing is not whether the opposition has the numbers to impeach the President but the issues which will be raised during the debates as that would educate Zambians what kind of a person they have as a President. On youth empowerment Chipimo said young people are looking for real solutions and not the piece meal solutions being offered by the PF. He said solutions such as the 10% of the black mountain given to Jerabos in Kitwe would not sort out the unemployment situation in the country. On the much talked about extravagance spending of Edgar Lungu and his people when they go on trips Chipimo said parliament should summon public workers involved in the saga and ensure that they get numbers from all the trips that the President has made including local trips. 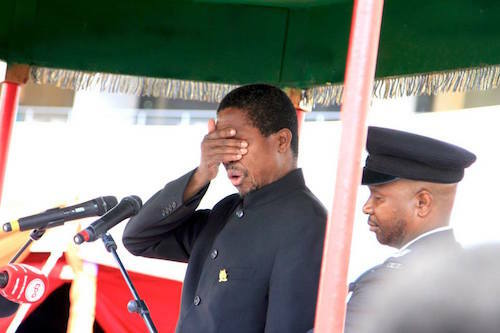 He said the money being spent on useless things was to much and that Zambians needed to demand accountability.